People usually say when you marry your partner, you’re not just marrying your partner. You’re marrying his entire family. And that’s kind of true. It’s like a buy-one-get-one deal that you never asked for but get anyways. This can be a big problem if you can’t stand your partner’s family, which, unfortunately, is the case for a great many people. It puts you in a very difficult position: You can’t imagine life without your partner, but as far as his family’s concerned? You could never see them again and be happy as a clam. But chances are, if you stay together, that’s not going to happen. So what can you do? 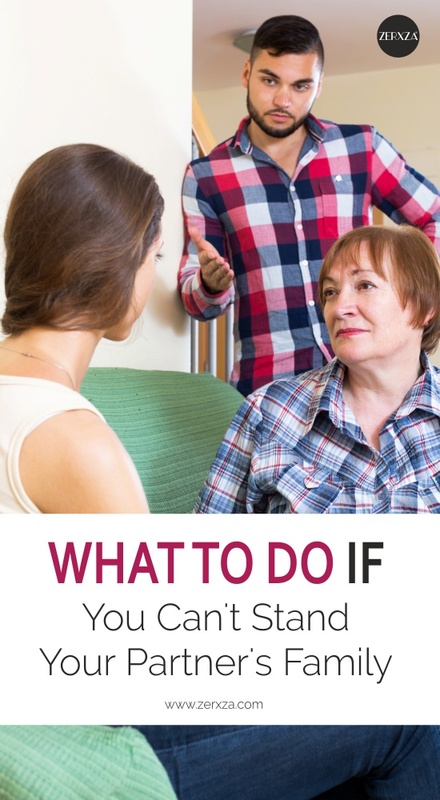 Your mother-in-law, sister-in-law, or anyone else, can try to pressure you to do things or make decisions on your behalf. In other words, they’re crossing important boundaries, and that is both offensive and hurtful – and rightfully so. But whatever you do, don’t lash out or go into a nasty tirade with the family member. Instead, bite your tongue and wait until you’re alone with your partner to let them know it’s time to set some specific boundaries. And it’s best if he (or he and you together) approach the subject in a calm and peaceful way. Remember, your partner’s family has known him since he was a wee thing, and although he might be able to talk back and get away with it, you absolutely don’t have this kind of power or position. So, whatever you do, always be respectful to your partner’s family. Creating tension will only make things harder. In fact, it may create unwanted distance between you and your partner. Now, biting your tongue and being respectful is not the same as being a wallflower or a pushover. Instead, you should always be kind and firm, especially on important matters, like religion, politics, child-rearing, food choices, and lifestyle. For example, if you’re vegan, but your partner’s family is always trying to dissuade you from your animal-free lifestyle, or even worse, trying to get you to taste a meaty dish, be kind and firm, and let them know you are not interested in discussing the matter, and that you will pass on the dish. Remember the story, “If you give a mouse a cookie…he’ll ask for a glass of milk”? Well, it’s the same concept here. If you give them an inch, they will walk all over you. You have to demonstrate that your lifestyle choices, your political leanings, and your religious or spiritual beliefs are not flimsy and random. They are something that you value. They are something you try to align your actions with. So, be kind and firm in demonstrating that. When people see you are not really serious about your convictions, they may lose respect for you, and take advantage of you even more. If your partner’s family member treats you badly, it puts you in a very bad position. They can do it behind your partner’s back. So, anytime you try to say something to him, you sound crazy. Why? Because he never see it happen, and it’s probably hard for him to believe that his family would do such a thing. It’s also a delicate situation because your partner may be pretty close to the family member in question, and also not want to approach them about their behavior towards you. But this doesn’t mean you have to stay quiet and let the abuse continue. So, here’s what you should do. After something happens, wait until you and your partner are alone, and most importantly wait until you are in a calm, emotional state. Then, lay down the facts. Keep it simple, keep it straight and above all, keep it objective. You never want to attack his family personally. You want to simply show him what happened. This way, he knows you’re not attacking his family members. And it also gives you more credence. If you come at him angry, upset and raging, you have fewer chances of being taken seriously or making any progress. Obviously, in an ideal world, you get along with your partner’s family and have a great time whenever you see them. In an ideal world, you feel valued and validated. But if that’s not the case, you have two choices. You can get angry and complain about how crappy your partner’s family is – both out loud and in your head. You can compare your current situation with your friends and wish you had it better. But this will leave you resentful. Plus, it makes it impossible for you to ever be at peace with your new family situation. So, that brings us to choice #2. Here’s your second choice. Imagine admitting to yourself that you actually don’t have to like your partner’s family. Admit that they actually don’t have to like you either. Admit that they don’t have to be your favorite people in the world. If you can just accept what is, and admit that you will probably never love your partner’s family, you can start to feel a lot less pressure. You can also set more reasonable expectations. For example, don’t go over to their house for a Sunday dinner, and expect to leave feeling amazing. Expect that it will be difficult and do some work to prepare yourself. For example, prepare yourself with kind, and firm responses. Prepare yourself by choosing to discuss common ground, rather than trying to prove your point or win an argument. If you can just admit that it is what it is, you can survive a little bit better. The truth is, we can’t control other people or their actions, but we can absolutely control how we behave, how we feel and how we react. This is all in your power and this is a very empowering standpoint. Sure, your mother-in-law can drive you crazy – if you let her. Or, you can just look at her with empathy and admit you don’t like her, and just let it go. There’s no magic pill to make difficult in-laws easier to live with. But these four basic tips may help you co-exist with a little more grace and ease. How Can You Be Sure the Person You’re Going to Marry Is “The One”?